In case you have been living on the dark side of the moon today, and yes, currently the Main Street Gazette resides on the dark side of the Disney moon, Disney’s California Adventure is getting a 1.1 billion dollar facelift. The most expensive facelift ever, and that includes any facelift any celebrity has ever purchased. You can read the article here, at the Wall Street Journal. I for one think this is a fabulous idea, California Adventure is the red-headed stepchild of the Disney Parks, and it is in need of an upgrade. I find two pieces of this remodeling project truly inspiring. One, it is going to be a park based upon the footsteps of Walt Disney himself. And two, it is not setting out to dismantle everything, scrap it clean, and build a totally new park. No, the key pieces of the park, like Soarin’ Over California and the Tower of Terror, are staying put, aside from a icon replacement. The new icon, Carthay Circle, isn’t actually new to the theme park scene, it isn’t even new to Disney theme parks. 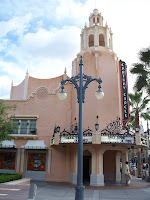 For the curious of you, and those of you seeking more of Sunset Blvd., as seen in articles earlier this week, a replica of Carthay Circle Theatre is located inside of Disney-MGM Studios, on Sunset Blvd. What place in Disney history does Carthay Circle hold? It was the location of the premier of Snow White and the Seven Dwarfs, almost 70 years ago now. On a personal note, this probably means the only time I will see the “original” California Adventure will be in two weeks when I am there for my honeymoon. I can’t wait to see, and experience, my first new Disney theme park since Animal Kingdom, but I am equally excited to see what the future holds for the new Adventure.